The more people are knowing about what your business is, the better for its own development especially you have just opened it not so long ago. Among of people that should know about your business, there is one kind of people that should be the first that I think have to be told. It is they who you have been known for so long whether they are your own families or friends, the neighbors, your colleagues, etc. Those are the people that have been known about you as well for years or even for just months with intense meets. I am surely have got my own reasons why you should do that ever since the customers of the business themselves can be anyone. Interested to know more about why you need to tell your friends and acquaintances about your business? Read all the lists below that I have been prepared of. If you are really sure about the business you are running, all of its benefits and many things, don’t you think that your friends and families are also deserved for that? Products or services will mostly have their own advantages and that’s why they can be a business. So that, why not selling those advantages for they who you have been knowing for so long? You have their own various contacts on your phone or e-mail lists that can make you easier to reach them all. So that, get them informed as well about your business as soon as possible. Promoting a business can be tired and also money consuming. But, there are actually some of the ways where you will only needs one little effort which is telling those who have been knowing you as well. Besides it won’t be spend a lot of money but only the phone or internet charge that you have been paid off, they may also thinking that you are considered them important for letting them know about your business. There is also a big chance that they you have known will also helping you promote the business without even need you to ordering them to do so. They will happily doing it for you without any feedback at all. Networking is no longer the new thing for us in many aspects of life. Whether it will be as the social network up to the professional limited networks, we are realizing that we do also trying to build our own networks. So do the people you have been known, they are also have their own networks. If your business will be fit to one or the two networks they have been built, then your business will reach more various customers without allowing you to spend the money for that. Basically, one of what people are offering from a business is how to help the customers with their own issues in life or work. If your business are also offering the same thing that can be the solution for the others, then you need to speaks it up more often especially with they that you have been known. Of all the reasons why people are buying things from you, one of it is because they are putting their trust on you. If you just ran a business for some days or months, getting trust from your potential customers can be hard sometimes But that won’t be applied when you are talking about business with your friends. Hammock is Nothing Short of Revolutionary, What Do You Say? Hammock has its very own cult following. A dedicated fan-base, these community of people exclaiming their love for their hammocks and hammock camping were even more apparent these days in the last decade or so. A lot of manufacturers started appearing to fulfill the needs of these hammock enthusiasts. While it may not overthrow the existence of a conventional tent altogether, it stands true that some people simply would not camp without a hammock. An occult following and its growing users are the reasons why hammocks are here to stay. Very few, if any, ground setup can beat the comfort of sleeping on a hammock. The ground setting does not provide a very good base when it comes to comfort in the first place. This is especially a problem when the grounds are especially challenging. Rocks, for example, could make camping in a tent completely torturous. And sleeping bags would only lessen that by the slightest bit. There are virtually countless of grounds that are not campers’ friendly. In places that are rocky, it can be virtually impossible to set up a tent or any kind of ground setup. Hammocks are not limited by this. Find two trees that are decently spaced and safe to hang your hammock on, then you’re all set. The feeling of hanging in a hammock for resting is so much more comfortable compared to sleeping on the ground with compromising ground state. Even though you’re bringing your full hammock camping gear, your setup is still going to be much lighter compared to the minimum setup of a tent camp. 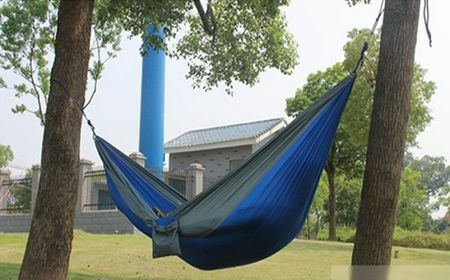 This is one of the most attractive qualities of a hammock compared to the more traditional camping by using tent. Adjusting is always the most challenging part of hammock camping. Most of us are not used to sleeping while bent over, and to some people, this may create a discomfort. It takes some intuitive fiddling around on the hammock. Keep on adjusting and readjusting your positions until you get the best out of your hammock and feel the most comfortable. But once you have passed this, you’re going to enjoy hammock camping like you’ve never been. There are types of hammocks that allow you to lie down in a flatter position. However, it stands true that you will not be able to lie completely flat like you are in your own bed even when you’re in the flattest hammock type. As mentioned previously, sleeping in a hammock is something that needs to be learned. There’s going to be trial and error for certain. However, once you have mastered your art of sleeping comfortably in a hammock, you’re going to be able to enjoy hammocking to the fullest. You won’t be able to go back sleeping on the ground with a sleeping bag.